Cllr Blackie Gavin, Cathaoirleach of Mayo Municipal District, was the first person to sign the visitor’s book on the day when approximately 140 people called into the centre to catch up with friends and colleagues and wish everyone in the centre continued success. 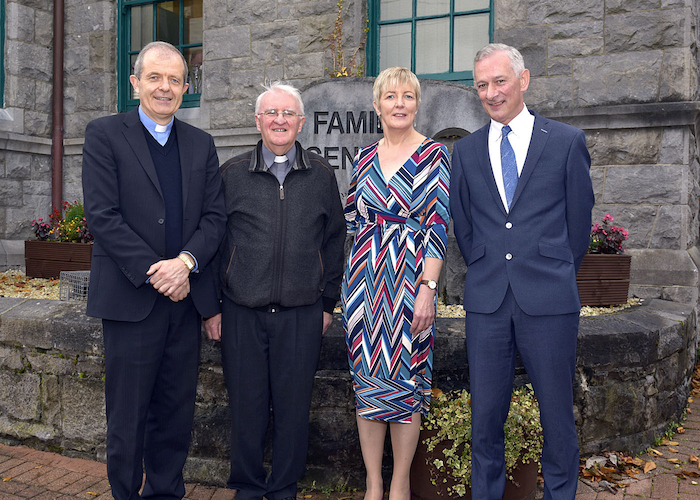 Over 60 people were in the audience to hear Archbishop Michael Neary; Charlie Meehan, HSE; Deirdre Roache TUSLA and Máire Ní Dhomhnaill, Director of the Family Centre, speak about the development and success of the centre over the last 20 years. Ni Dhomnaill gave an outline of the work and achievements of the service to past and present board members, staff and volunteers plus representatives from a number of statutory and non statutory services from the region. Among those in attendance were Lisa Chambers TD and Cllr Michael Kilcoyne. Ms Ni Dhomnaill said the centre was celebrating “Fíche bliain ag Fás – twenty years a- growing and we’re now heading into Fíche bliain faoi bhláth- twenty years a – flowering / flourishing" and on behalf of the staff and Board thanked all who called and wished them well and all those who support them on an on-going basis.